The success of any professional is measured by the level of his/her skills related to the profession. Usually, the career of a person is not shaped by just one skill. It is usually through the acquiring of different skills over the course of one’s professional life that a person can truly move forward and earn success. When it comes to getting a job that you always wanted or getting hold of a freelance job, it all comes to more than just the skills for graphic designer jobs. The same goes for any graphics designer. Strong communication is the versatile soft skill that is going to be an important asset wherever you go. Communication is about everything when you are a professional person, without which the below-mentioned skills are not even effective. If you want to collaborate effectively, network with others or market your abilities, it all depends on how you communicate. If you have a great design idea but you cannot put it into words properly and communicate with others regarding it, your idea will remain an idea. So, it is important that you should learn what effective communication is all about. If you think you are poor at communication, you should take the help of professionals. Can you finish your job on time? Time management is an important skill that usually comes with experience. Are you able to finish your design before the due date or have to keep on replying to angry query emails of your clients? If you do not learn to manage your time effectively, you are going to be stuck on the lower rung of the career ladder. More than often it is needed that you should work as a team to complete a project. So if you have problems collaborating with others to share your ideas and accept other people’s ideas, then it can affect you at the workplace. There are a lot of benefits if you work as a team. You can learn new methods of designing; expand your understanding regarding the visual view and get feedback related to your work. You know your design is going to be a great one; now how are you going to convince your client? This is where your marketing skills are going to come handy. It is natural that your clients might be doubtful about the design, but one thing you should remember is that you are the designer here. You should convince them why your design is going to be perfect for their requirements and how it is related to the message they want to deliver. Worrying that your design might fail? It is going to if you do not take a leap of faith. If you want to be unique and get noticed, sometimes you need to do something audacious. It is risks that separate the extraordinary from the normal. Take risks with your ideas when you are confident that the decision is coming from your heart. Grow your network and move your career ahead. Never underestimate the power of networking. It can help you to take your career towards a whole new dimension if you know how to use your professional network effectively. You can meet new clients if you are a freelancer or get the opportunity of a lifetime to work somewhere you only dreamt of. Upgrading or adding new skills to your existing one show your career progress and also provide you with an extra edge over other professionals. 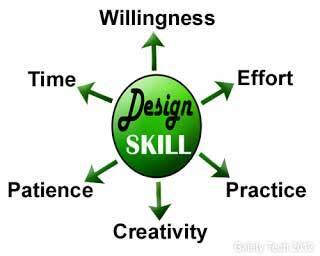 Comment below to show how soft skills had an impact on your graphics designing career?